The international community has launched numerous initiatives to respond to land grabbing since the huge scale of this phenomenon became evident in 2008. The greatest progress so far has been made with voluntary guidelines, which require new procedures to ensure that they function effectively. The French Cooperation is now putting in place analytical tools and internal procedures to ensure that all activities supported by the Ministry of Foreign Affairs and the French Development Agency (including its subsidiary Proparco, which supports the private sector) follow these guidelines and, more broadly, that they are respected by French actors involved in agricultural investments that affect landholdings. This task was assigned to the ‘Land Tenure and Development’ Technical Committee, a body that provides a forum to debate ideas and build on research findings and project experiences, co-chaired by the Ministry of Foreign Affairs and AFD. The Gret-IIED-Agter consortium that the committee appointed to lead this collective reflection has mobilized committee members and about ten AFD and Proparco project officers around the process. In 2013 and 2014 the team used an iterative approach and a series of group and one-to-one meetings to review existing voluntary frameworks and produce an analytical framework and guide that each institution can now use to change their internal project appraisal procedures. This document is an analytical review of existing international voluntary frameworks. It was produced by Michel Merlet (Agter), in conjunction with Amel Benkahla (Gret), Lorenzo Cotula (IIED), Thierry Berger (IIED) and Mathieu Perdriault (Agter) and with contributions from other members of the ‘Land Tenure and Development’ Technical Committee. 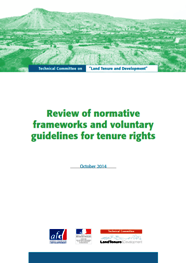 Land management and tenure are regulated by many, very different normative frameworks. Public, private, national and international, their scale and scope vary according to when and where they have been implemented and whether they are binding or voluntary. While much of the current debate on this issue centres around the Voluntary Guidelines on the Responsible Governance of Land Tenure regimes approved in 2012 by the Committee on World Food Security (CFS), it is important to remember that this is by no means the first or only initiative regarding the regulation of land governance. In order to better understand the range and application of these Voluntary Guidelines, we also need to consider the context in which they are expected to operate. Every country has its own normative frameworks established under formally recognised laws and ‘customary’ mechanisms. However, this is not the place to examine the various normative mechanisms associated with land tenure in each country. This paper will focus exclusively on international mechanisms involving at least two countries. The document starts with a brief review of the different types of international normative frameworks that have had direct implications for land management. In part 2, it looks at initiatives taken in response to the escalation of large-scale land appropriation and concentration, which has been widely reported since 2008. It reviews then the Principles for Responsible Investment in Agriculture and Food Systems, adopted by the CFS in 2014. After exploring the expected effects of their incorporation within national policies, the document considers the implications of this review for the work done by the ‘Land Tenure and Development’Technical Committee on transparency and contract negotiations. This document can be downloaded here from the Land Tenure and Development website (www.foncier-developpement.fr/wp-content/uploads/Review-of-normative-frameworks.pdf).